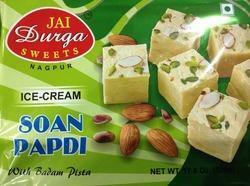 Since the day of inception, we have been successfully manufacturing and supplying Ice Cream Soan Papdi. This soan papdi is prepared using quality ingredients such as milk, natural extracts and sugar. Further, our offered soan papdi is widely demanded by customers to serve as a sweet during formal as well as casual get together. Looking for Ice Cream Soan Papdi ?